The last couple weeks have been extremely busy for my options game. That's great because it's a law of large numbers game when you're dealing with probabilities. Essentially the more occurrences that you can put on the closer your results will play out as the probabilities predict. Of course having free trades in my Rollover IRA and very low commissions in my new Roth IRA sure does help. Since I had over 30 total moves to report for last week I'm breaking the weekly recap into 2 posts. Today I'll cover all of the new or rolled positions and later this week I'll take a look at the closed positions from last week. After my earnings play covered call on Colgate expired OTM that left me with just one choice: sell another covered call. While I'd love to establish a position in Colgate and hold it forever, the problem is that the valuation isn't enticing at these levels. This position originally started in April as part of a buy-write to try and collect the dividend, some option premium and some price appreciation. I still own the shares so that didn't go as planned. However, the good thing about writing options against the stock that you own is that you get to reduce your cost basis. I purchased the shares for $73.74 per share and have since sold 2 covered calls, not including this one, that have generated a total of $208.90 in cost basis reduction so I now effectively own shares at $71.65. If Colgate's share price is above $73.50 at expiration then I'll have to sell my shares at an effective sale price of $74.24. That's just fine by me if that happens because that would be a solid 3.61% return. If Colgate's share price is below $73.50 at expiration then I'll get to keep my shares and the option premium would be profit. 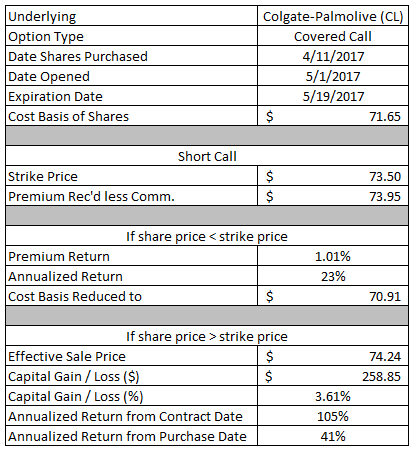 The $73.95 in option premium would be a 1.01% return based on the $73.50 strike price which would be a 23% annualized return. My cost basis on these shares would effectively be reduced to $70.91. This was a defensive move more than anything else because in late April I had put on a bearish call credit spread on IWM that had decidedly gone against me. By adding on the $137/139 put credit spread I converted the position into an iron butterfly in order to limit my losses should IWM have continued higher. If I happen to get lucky and IWM ends up on the shared $139 strike then I'll reach max profit on both spreads. The max profit that the put credit spread can generate is the credit received, $58.71, at order entry. The maximum possible loss is the $2.00 width of the spread less the credit received or $141.29. If IWM is above $139 at expiration then both contracts would be OTM and I would achieve maximum profit. The $58.71 credit would represent a 29.4% return on capital. If IWM is below $137 at expiration then both contracts would be ITM and I would realize the maximum loss of $141.29. 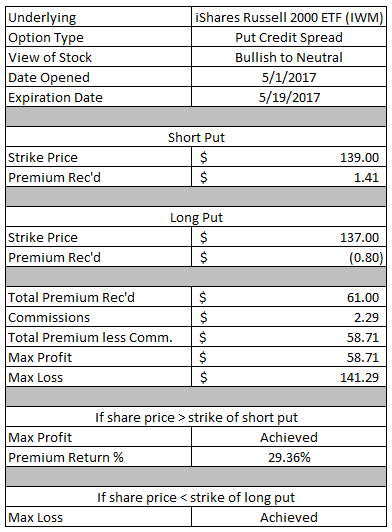 After opening my TastyWorks Roth IRA last month I've been trying to put on as many trades as I can if I find a set up that I like. Unfortunately with the small account balance that means lots of defined risk trades which are both good and bad, but it really works out to a numbers/probability game more than anything else. The maximum profit this spread can generate is the $61.71 credit received at order entry. The maximum potential loss is $138.29. If Johnson & Johnson's share price is above $122 at expiration then both contracts would expire OTM and I would realize the maximum profit. The $61.71 would represent a 30.9% return on capital. If Johnson & Johnson's share price is below $120 at expiration then both contracts would be ITM and I would realize the maximum loss of $138.29. My goal for this position is for Johnson & Johnson to just either sit at these levels or move higher and let the time value erode the value of the options. That would allow me to close the position out early and lock in profits. My target profit is 50% of the credit received. While the short put option is my go to move within my Rollover IRA, this underlying is far from it. However, I decided to go out on the limb a bit and take on some more risk. AMD announced earnings early last week and the share price sold off around 25% which meant implied volatility was extremely elevated. So I took a bit of a contrarian stance with the hopes that IV will decline over the coming days/weeks as AMD's share price drifts a bit higher after a selloff that large. If AMD's share price is below $10 at expiration then I'll have to purchase 100 shares at an adjusted cost basis of $9.38 per share. That's nearly an 8% discount from the current share price. 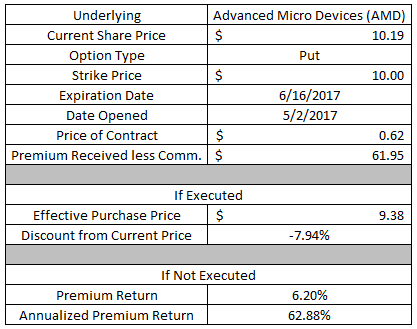 If AMD's share price is above $10 at expiration then the contract would expire OTM and I would get to keep the full option premium as profit. The $61.95 would be a huge 6.2% return on the $1,000 of capital necessary to secure the contract. If held through expiration it would be the equivalent of a 62.9% annualized return. Since AMD isn't exactly a company that I want to own I'll be looking to close out this position early in order to lock in around 50% of the credit received. The idea behind this put option was actually borrowed from fellow blogger, Financial Velociraptor. 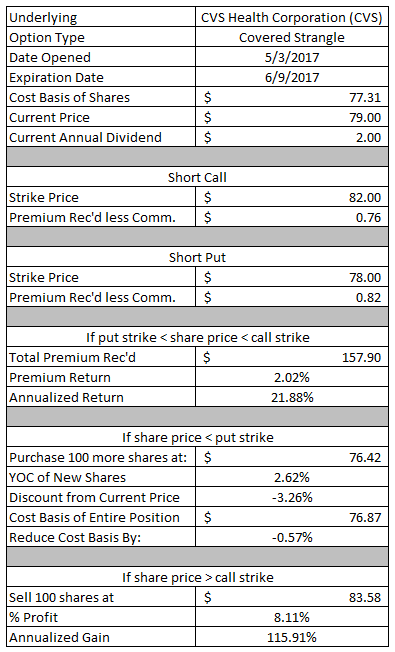 I went with a bit more downside protection by selling a lower strike contract while giving up a bit of profit potential, but it was a tradeoff I was willing to make for a company that I don't follow. If Micron's share price is below $27 at expiration then I'll have to purchase 100 shares at an adjusted cost basis of $26.17. That's a 7.2% discount from the current share price. 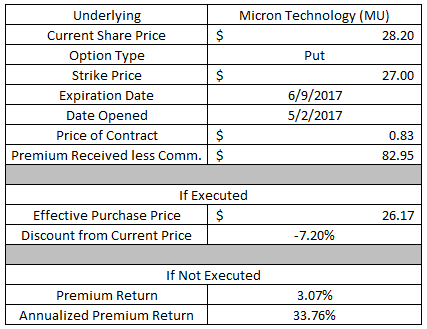 If Micron's share price is above $27 at expiration then the option would be OTM and I would get to keep the full option premium as profit. The $82.95 in option premium would be a 3.07% return on the $2,700 in capital required to secure the contract. Through expiration that would be an annualized return of 33.8%. Similar to AMD, I don't really want to take ownership of the shares of Micron so I'll look to close out the position early to take risk off the table and lock in profits. My target profit is 50% of the credit received. As many of you know I've owned CVS since late January and have been writing covered strangles against the position in order to reduce my cost basis. Covered strangles allow you to bring in more premium as opposed to just selling a covered call, but at the risk of having to purchase another 100 shares in the underlying. 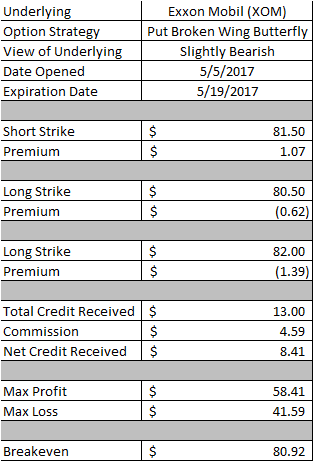 So far I've been able to reduce my cost basis from $83.24 all the way down to $77.31 by selling options around the position. I effectively own CVS for $5.89 per share cheaper than what I purchased them for. If CVS' share price remains between the two short strikes, $78 and $82, then both contracts would be OTM and I would get to keep the option premium as profit. The $157.90 in option premium would be a 2.02% return on the $7,800 in capital securing the put side of the covered strangle. If held to expiration that would be a equivalent to a 21.9% annualized return. If CVS' share price is below the $78 strike of the short put then I'll have to purchase an additional 100 shares at and adjusted cost basis of $76.42. That would reduce the per share cost basis of my entire position to $76.87. If CVS' share price is above the $82 strike of the short call then I'll have to sell the 100 shares that I own at an effective sale price of $83.58. That would represent an 8.1% gain on my current lot of shares. Since announcing earnings the implied volatility for Microsoft has come out some, but it's still at elevated levels. That meant that the option premium was rich so I decided to sell a put option even though it doesn't give me an ideal purchase price if its executed. If Microsoft's share price is below $67.50 at expiration then I'll have to purchase 100 shares at an adjusted cost basis of $66.59 or about a 3.5% discount from the current share price. The YOC at that level would be a decent 2.34%. The valuation wouldn't be ideal at 23.9x 2016's EPS and 22.0x the estimate for the current year, but it's close enough for a company that still has plenty of dividend growth left in the tank. Plus I would also turn around and start selling covered calls against the shares should they be put to me. 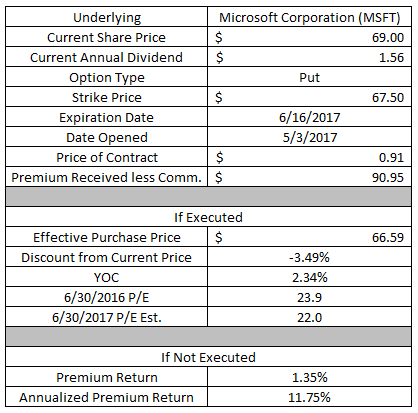 If Microsoft's share price is above $67.50 at expiration then the contract would be OTM. That would mean I'd get to keep the full option premium as profit. The $90.95 would be a 1.35% return on on the $6,750 in capital securing the contract. If held through expiration that would be equivalent to a 11.8% annualized return. After having 100 shares of Pfizer put to me in late April the go to move is to then sell covered calls against them. The covered call allows you to reduce your cost basis which is always a win in the long run. If Pfizer's share price is above $34 at expiration then I'll have to sell the 100 shares that I own at an effective sale price of $34.26. That would be a 2.20% gain on my adjusted cost basis of $33.52. If Pfizer's share price is below $34 at expiration then the call option would expire OTM and I would get to keep the premium as profit. The $25.95 in option premium would be a 0.76% return based on the $34 strike of the contract. Through expiration that would be a 7% annualized return and the adjusted cost basis on my existing position would be reduced to $33.26. I don't know what bit of news came out that led to AT&T's share price dipping this past week, but whatever it was I'm grateful for it. AT&T is one of those steady companies that won't rise to the moon, but won't leave a barren wasteland in your portfolio. Of course that dividend sure does help cushion the blow of any share price declines. If AT&T's share price is below $37 at expiration then I'll have to purchase 100 shares at an adjusted cost basis of $36.53 which is a 5.3% discount from the current share price. The YOC at that level would be a solid 5.37% with fairly attractive valuations of 12.9x 2016's EPS and 12.6x 2017's estimates. 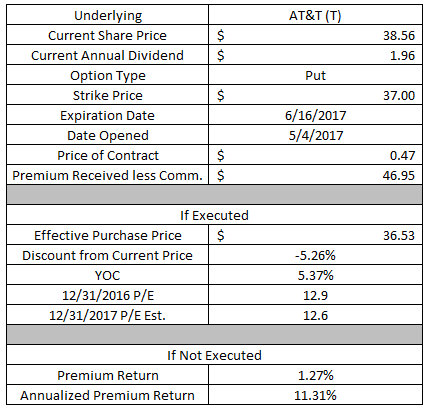 If AT&T's share price is above $37 at expiration then the contract would expire worthless and I would get to keep the full option premium as profit. The $46.95 in option premium would be a solid 1.27% return on the $3,700 in capital securing the contract. If held through expiration that would be equivalent to an 11.3% annualized return. Armed with limited capital in my new Roth IRA I've been experimenting with other defined risk option strategies to see what I like and don't like. One such strategy is the broken wing butterfly which is done by selling 2 contracts at a given strike and then buying 1 contract at a strike that is closer to being ITM and 1 contract at a strike that is further OTM. This creates both a credit and debit spread on the underlying where the short strike is shared and should be done for a net credit. What I like about this strategy is that if even if you're wrong directionally you can still generate a profit and there's a sweet spot where you make maximize your profit. The maximum profit I can make on this position is $128.41. The maximum loss I can take on this trade is $67.00. When using all puts for the broken wing butterfly the position is slightly bearish since the maximum profit is achieved at your short strike which should be below the current price of the underlying. If Apple's share price drifts lower to the $147 short strike, then at expiration I would generate the maximum profit. If Apple's share price moves lower than the $145 long strike, then at expiration I would realize the maximum loss. As long as Apple's share price is at my breakeven, $145.67, or higher then I will realize a profit of some kind on this trade. The great thing though is that since this position was put on for a net credit I will realize a profit even if Apple's share price doesn't cooperate and remains above the $148 long put strike. The profit would be small at just the net credit received, but you have to keep in mind that the capital at risk is only $67 so that's still nearly a 50% return on capital. My profit target goal on this trade is to close the position around 50% of the maximum profit which would be done for a net credit. While I should probably have just stuck with one put BWBF to test the waters, what better way than to go full on to see how things work out. After all, 1 occurrence isn't enough to determine whether I want to keep this strategy in my playbook or not. 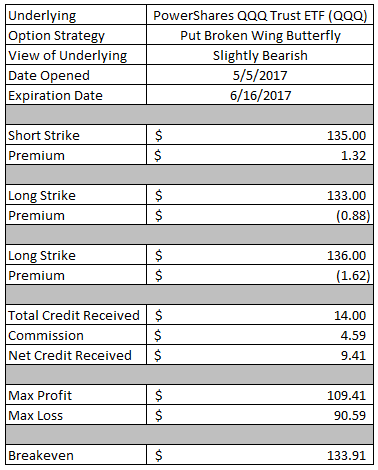 The maximum profit I can make on this position is $118.41 while the maximum potential loss is $81.59. The breakeven point at expiration is $107.77. If Union Pacific's share price drifts lower to the $109 short strike, then at expiration I would realize the maximum profit. If Union Pacific's share price is lower than the $107 long strike then I would realize the maximum loss. As long as Union Pacific is trading higher than $107.77 at expiration then I will realize a profit of some kind on this trade. My profit target is to sell the put BWBF back out on the market to close the position for a net credit that is 50% of the maximum profit potential. Along with putting on multiple broken wing butterfly positions I also want to test out different underlyings to see how they go. With 4 total contracts involved in the broken wing butterfly I assume that I'll be best served to stick with the most liquid underlyings which will likely mean broad market ETFs and a few select individual companies. The maximum profit potential on this trade is $113.41 while the maximum potential loss is $86.59. At expiration the breakeven price is $236.87. If SPY is trading at $238 at expiration then I will realize the maximum profit. If SPY is trading below $236 then I will realize the maximum loss. At expiration as long as SPY is trading at $236.87 or higher I will realize a profit on this trade. My goal it to close this position at 50% of the maximum potential profit. It's time for a break from the broken wing butterfly discussion with a put option I sold on a Dividend Aristocrat. Archer Daniels Midland reported what was generally a solid earnings report, but apparently something ruffled Mr. Market's feathers and the share price declined around 4%. That was music to my ears since it meant I had the opportunity to sell a put option at a lower strike and for a higher price than I could have the day before. If Archer Daniels Midland's share price is below $43 at expiration then I'll have purchase 100 shares at an adjusted cost basis of $41.65. The YOC at that cost basis would be a solid 3.07% and the valuation would be intriguing at 19.3x 2016's earnings and just 15.1x 2017's estimates. 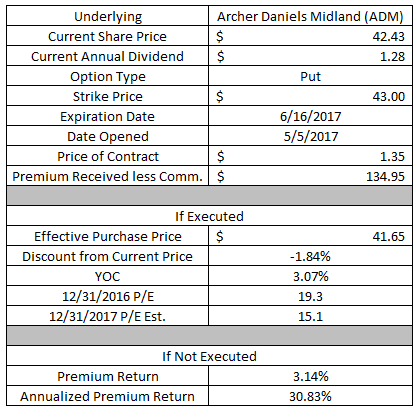 If Archer Daniels Midland's share price is above $43 at expiration then I'll get to keep the full option premium as profit. 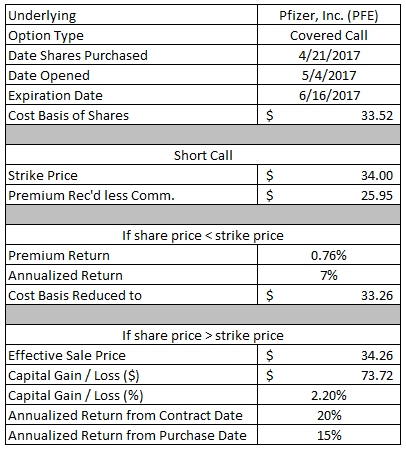 The $134.95 in option premium would be a 3.14% return on the $4,300 in capital used to secure the contract. Through expiration that would be equivalent to a 30.8% annualized return. Now let's get back to the broken wing butterfly's. The maximum profit potential on this trade is $58.41 while the maximum loss is $41.59. At expiration the breakeven price is $80.92. If Exxon Mobil's share price is trading at $81.50 at expiration then I will realize the maximum profit on this position. If Exxon Mobil is trading below $80.50 then I will realize the maximum loss. As long as Exxon Mobil's share price remains above $80.92 at expiration then I will realize a profit on this position. My target is to close this position at 50% of the maximum profit potential. Facebook continues to have relatively high implied volatility after releasing earnings last week which is exactly what you want to see when putting on a broken wing butterfly. The maximum potential profit on this trade is $111.41 while the maximum potential loss is $88.59. At expiration the breakeven price is $147.89. If Facebook is trading at the $149 strike of the short put option then I will realize the maximum profit for this trade. If Facebook is trading below the $147 strike of the long put then I will realize the maximum loss. My target will be to close the position at 50% of the maximum potential profit. After putting on several broken wing butterfly positions on individual companies it was time to move back to the broad market ETFs to test out the strategy there. The maximum potential profit on this trade is $109.41 while the maximum possible loss if $90.59. At expiration the breakeven point is $133.91. If QQQ is trading at $135 at expiration then I will realize the maximum possible profit. If QQQ is trading below $133 then I will realize the maximum possible loss. My target will be to close the position out at 50% of the maximum profit potential. Up until this point I had only done put broken wing butterfly's; however, you can do the same thing on the call side. Although the call broken wing butterfly is a slightly bullish trade where you want the underlying to move up to the short strike of your BWBF. The maximum possible profit on this position is $111.41 whereas the maximum possible loss is $88.59. At expiration the breakeven price would be $140.11. I will realize the maximum profit on this trade if QQQ is trading at $139 at expiration. If QQQ is trading above $141 then I will realize the maximum loss. My target is to close the position at 50% of the maximum potential profit. When you look at the 2 broken wing butterfly's that I put on QQQ you can think of them as a quasi-iron condor with profit kicker points should the underlying land at either of the short strikes. I like that because the traditional iron condor offers relatively small profit potential, although the chances of success is quite high. These trades in conjunction with one another offer a similar probability of success on the entire position, but have the possibility of higher profits. This was an earnings play that didn't quite go as planned; however, I was able to roll the position out in time and collect a sizable credit for doing so. I originally sold this put option right before earnings on the hopes that the combination of volatility crush and a slight increase in Pfizer's share price would allow me to lock in some quick profits. That didn't go as planned, but I'm just fine with how things played out because I was able to extend the duration and take in additional option premium. I was able to collect $0.44 in additional credits by moving the expiration out until June 16th. That brings the total credits received on this position to $0.80 per share. With the additional option premium my breakeven price, or potential purchase price, was reduced from $33.64 to $33.20. At expiration if Pfizer's share price is above $34 then the contract would be OTM and I would get to keep the full option premium as profit. That would be a 2.35% return on the $3,400 in capital securing the contract or a 20.2% annualized return. This position has been with me for what seems like ages although in reality it's only just over 2 months. If I remember correctly the original put option was sold as an earnings play that didn't work out right and I've been rolling it out in time ever since. 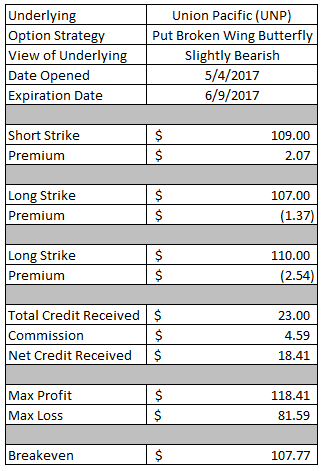 I was able to collect an additional $0.25 per share to move the expiration date out until June 16th. 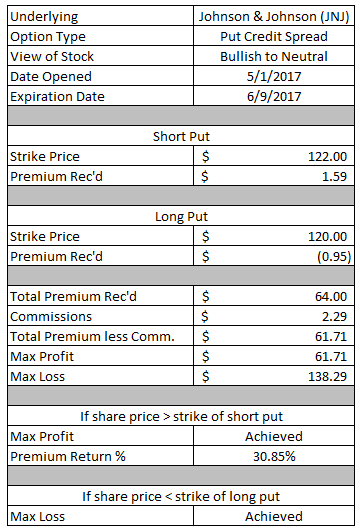 Thus far I've collected a total of $1.18 per share in option premium from the rolls and a total of $2.23 per share including the original put's credit. The original contract's breakeven price was $56.95; however, by extending the duration of the trade I've been able to reduce my effective purchase price to $55.27. 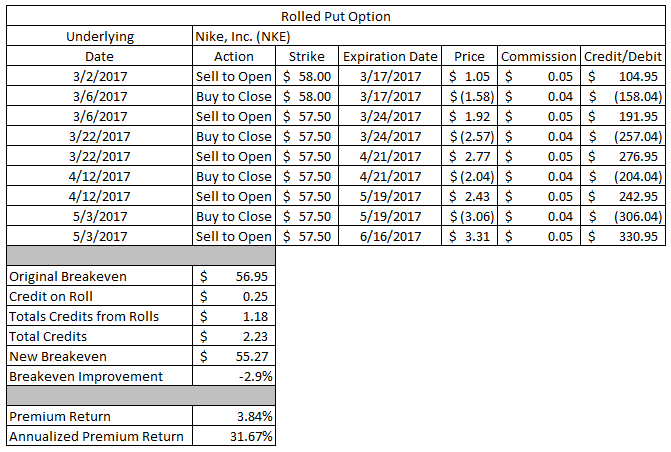 If at expiration Nike's share price is above $57.50 then I will get to keep the entire option premium as profit. The $223 would represent a 3.84% return on the $5,750 in capital securing the contract. There's a typo in the table and the annualized premium return would actually be 13.9%. 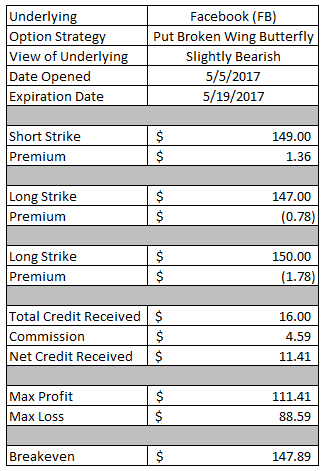 April was by far my best month ever for options trading although a good chunk of that came from successful earnings plays. Although, I don't really care how the profits come as long as they keep doing so. 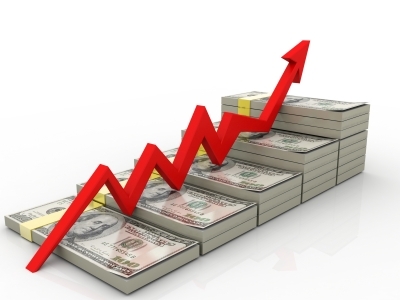 In April I generated net profits of $2,071.79 via options trades. Year to date my realized profits are $6,864.94. Since all of the trades reported on today were new or rolled positions you'll just have to wait until later this week to find out how the first week of May was for closed positions. I do have to say though that it was my most profitable week yet. Crazy amount of moves! Great work. I've put the pause on options lately, but I imagine in several months I'll relook them. Just read a WSJ article suggesting options activity has been getting smaller and smaller lately, which is interesting. Wondering if it is because volatility has been so low? I also wrote a put on ADM. Great minds!